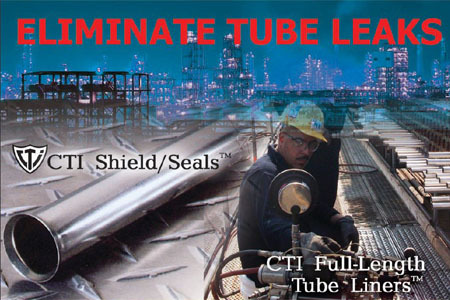 OK, you’ve seen the name before and heard of CTI Full Length Tube Liners and CTI Shield/Seals. Many of you have actually used CTI’s services and had great success with the company’s heat exchanger restoration. To a great many of you, thin-walled alloy tube liners are still a mystery. CTI is trying to change that. CTI Industries continues to offer the best way to increase the reliability and service life of your critical heat exchanger tubes. When carbon steel tubes just aren’t getting the job done, designing new exchangers with Full Length Tube Liners from CTI Industries should be considered.